SUDBURY, ON—Carrying a torch for 20 years would be a burden for many, but for the students of Lockerby Composite School, it is an honour they do not take lightly. When an eight-year old student Laura Cotesta was first diagnosed with a spinal cord tumour, there were no services for children with cancer in Sudbury, forcing her to travel to Toronto for her treatments. Laura’s cancer returned five times. 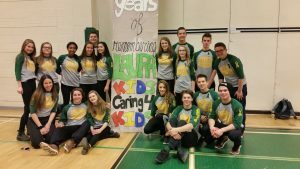 Years later, as a secondary school student at Lockerby Composite School, Laura decided to think of her illness as an opportunity to take action and launched the Kids Caring for Kids Cancer Drive, a door-to-door fundraising effort to help support the establishment of a local cancer centre. Just after graduating from high school and after two successful Cancer Drives, 18-year old Laura succumbed to the disease. That was in 1997. Nevertheless, the Cancer Drive continued to gain momentum year after year. After Laura’s passing, her sisters led the initiative. Today, the students of Lockerby—who were not even born at the time Laura studied there—carry on the fundraising effort in droves. Planning such a large-scale event provides room for learning and personal growth. Boldness has genius, power, and magic in it! Two decades after Laura Cotesta’s boldness produced the first Cancer Drive, Lockerby students demonstrate genius in their event planning, power in their numbers and magic in their collective energy. The Ontario Volunteer Centre Network, administrator of the ChangeTheWorld – Ontario Youth Volunteer Challenge, thanks Lauren-Ashleigh Beaudry, Ethan Gladu, Ashley Fraser and Volunteer Sudbury for this interview and congratulates Lockerby Composite School on the Cancer Drive’s 20th anniversary. 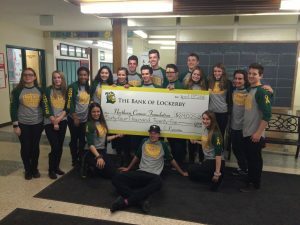 For more information on the Lockerby Cancer Drive, visit www.lockerbycancerdrive.com.